The seventh match between Mumbai Indians and Royal Challengers Bangalore, that was turning out to be one of the most interesting matches ended with a controversy that overshadowed the amazing match. 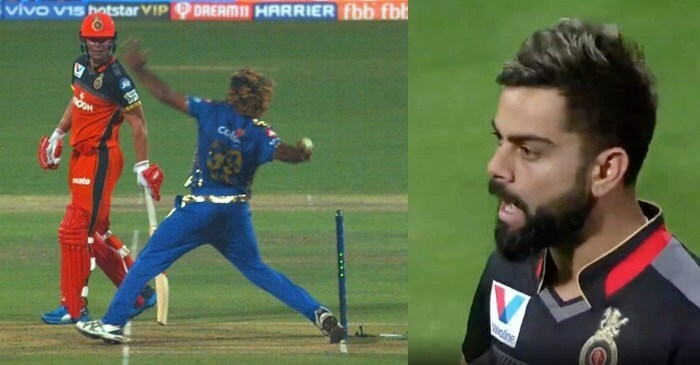 The match saw a major howler by the umpire Sundaram Ravi as he failed to spot Mumbai Indians’ bowler Lasith Malinga overstepping off the last ball to RCB batsman Shivam Dubey, with RCB only needing 6 runs to win. Umpire Ravi is one of the four Indian umpires that belong to the International Panel of ICC umpires and is a part of the 12-members elite panel. It is being said that he even missed a couple of other no-balls and a wide in the match apart from Malinga’s last ball, that caught everyone’s attention. Why there’s a need for independent technology or feature that just calls “No balls”? The ‘No-Ball’ howler of Umpire Ravi once again highlighted the poor standards of umpiring in the IPL and generated a keen debate on social media, with many people demanding a new technology or feature for “no-ball, that will not just give some relief to the already overburdened umpires but will also prevent such howlers in the matches. This has now become a matter of concern for everyone, that if an international umpire is committing mistakes of this stature, we can’t even imagine the state and the quality at other local tournaments and leagues. In the year 2017, a total of 25 howlers took place that eventually resulted in the use of DRS in the game. Today, DRS is a regular feature of the Indian Premier League. Ever since the DRS has been included in the game, it has highlighted many umpiring howlers, with as many as 7 decisions being overturned in 9 matches. Just like the DRS, there should be a separate technology to eliminate the “no-ball” errors as well. The point was brought in by the former cricketer Kevin Pietersen who called for a separate technology, that will spot no-balls. “Winning or losing doesn’t matter. It is not good for the game of cricket. Those sorts of mistakes have to be avoided”. Well, with the beginning of a tournament like this and players using Mankad-ing, the umpires have a big responsibility on their shoulders along with additional pressure from now onwards of being watched closely. if the fans are based out of United States then visit the one of the best american online casino to check if they allow betting on IPL matches.